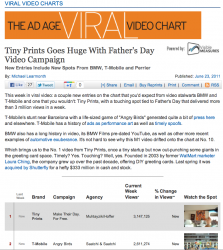 Our Tiny Prints spot tops the Ad Age Viral chart. “Tiny Prints Goes Huge With Father’s Day Video Campaign” to use their words exactly. Money quote: This week in viral video: a couple new entries on the chart that you’d expect from video stalwarts BMW and T-Mobile and one that you wouldn’t: Tiny Prints, with a touching spot tied to Father’s Day that delivered more than 3 million views in a week.